Unique new concept for a CQB belt system that can easily be converted to a rappel or extraction seat harness. Belt portion of harness can be worn as a standard CQB belt. Leg support portion of harness is easily attached to the belt with Cobra quick connect buckles. Leg portion is small enough to be stowed in BDU leg pockets. 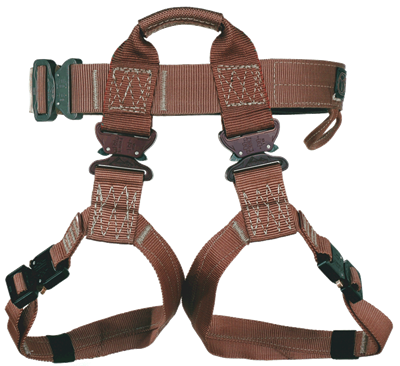 Harness attachment point is well suited for all rappel and extraction situations. Weight 1 lb. 6 oz. as a CQB belt on users BDU’s. Two layer webbing on the belt area of the harness supports wearing side arm. Leg portion can be quickly donned by releasing webbing keepers, pulling seat strap between legs and clipping to waist loop with carabiner. Attachment point is well suited for all rappel and extraction situations. Certified by NATICK Soldier Research Development and Engineering Center to meet MIL STD 858, Test Methods T102, modified for extraction harnesses. Weight 1 lb. Made in USA. Offers a new twist on the traditional padded modular belt. 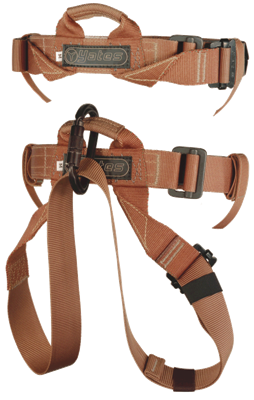 Designed to work with your choice of belt, whether you want to work with a duty belt or your favorite rigger's belt. Constructed of light 500 denier cordura, with strategic reinforcemetns and flame resistant FR lining to holld up to whatever punishment you can dish out. The pads expand up to 6 inches for different waist sizes and feature slots to attach leg rigs or thigh holsters directly to the belt instead of hanging from the webbing. Battle Belt can be worn alone or in conjuction with our Fight Light 4 Point Harness for added stability.